Exercises for Chapter 1, "The Undefended Self"
My deepest desire, however, is to be at peace with the conflicting dualities of my nature. To resolve the feeling that I have made so many mistakes and am now a 'failure.' That the fears of my real physical paralysis will cease and I will realize the control (belief in) a higher power is all that matters. I would like to accept the status of my life at the moment and not think about my physical shortcomings. I need to lose envy, jealousy and bigotry (in the sense of being better than). Night brings peace; a semblance of normalcy in dream state. In waking a return to searing, pricking and stiffness. A trader turned taxi driver takes me to a healing mass with his mother and aunt. He wants me to use my money to help buy his seat back on the trading floor. I think it's feasible; my parents nix it. Is this a stupid trait or an intuitively courageous one? Would I have made a lot on my investments? I believe so...why have I been unable to wield financial power? On the fourth of October a silent father passes. Chiseled on the wall near his gravesite...'No man is an island...' The sun is shining. Across the park and to the right lived a young couple; he taught high school art and she worked for the fabric company, China Seas. They had two floors of an old house, their studios in the attic space. I enjoyed their company, food and visitors. One in particular, Wolfgang Strankowski, a Polish artist from Berlin took my interest. We chatted for hours; he being fluent in English. An easy walk to my house to show him what I was up to lasted until the next morning. 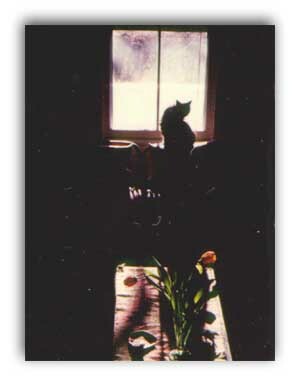 He was visiting an older German artist in Kutztown, Pennsylvania also a friend of Florrie and Richard's. Well we drove to PA to pick up his things and started living together in artistic bliss. Wolfy was a European intellectual; I always ate that up. He was, however, intense in his needs and work...also had a very ruptured childhood and upbringing. Some strange incestuous relationship to his mother. A brother resided in Toronto, a wintry ride to a phenomenal city. I believe it was in my beige Corolla. We both loved antiques, galleries, traveling, good food and wine. He didn't know how to romance a stone, let alone a woman. Nonetheless upon our return I called the village judge and asked him to marry us. John Dunne said we had to wait three days; he also thought I was being rash. Not that he really knew me. He did drive me home once from a meeting I spoke at and tried to 'make out!' Didn't make him impartial. A couple of days later I changed my mind. Too many demands on my life and not enough support to make it worth while. WS returned to Germany and we continued a lengthy correspondence. He sent me a $1000 to visit; I used it to pay the energy bill. Felt he had to contribute to his stay here. I met my next employer while buying supplies and small printing items. Michael Randall needed someone willing to learn the new typesetting equipment who also had a design background. It sounded perfect, the business was about a mile down the street from our home. Salary was decent and I loved learning new techniques. Compugraphics was replacing hot press, those lead letters that took so long to place by hand. It also meant women would be able to enter that job market. He was intrigued by my background and skills. I went to meet his wife in their new home and felt uncomfortable. Needless to say I continued working and organizing an upcoming exhibit at Brooklyn College. 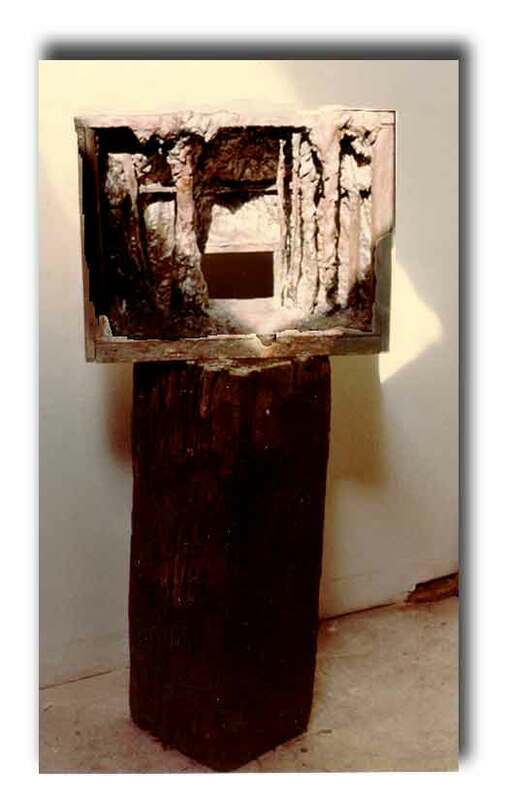 Cave #1 (1983) was created in the manner of a stage model. It allowed me to be in the cave, to see out from inside. 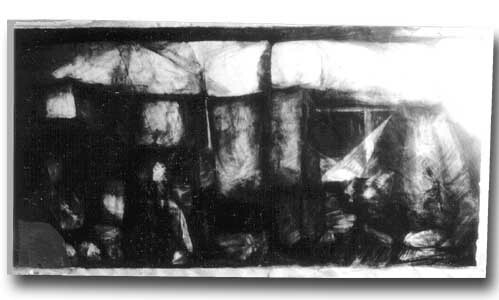 Wood formed the armature, clay, cloth and plaster made it permanent. 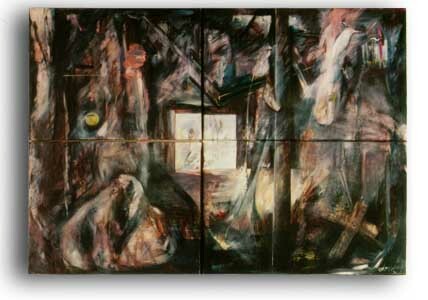 The 3D piece became the subject of a painting, Inside Looking Out (1983) an oil on four panels. All the symbolic items: apple, dove, cross, split rock and figure sowing grain were spontaneous. I was open to the flow and sought a spiritual response. What it means exactly is up to the viewer. 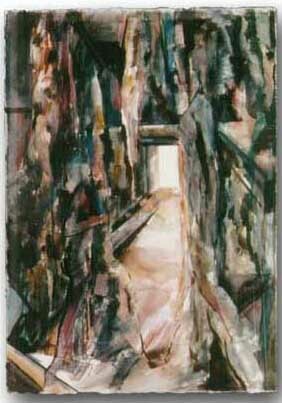 The work continued on in this direction including a dozen or so large watercolors. Statuary IV is one of my favorites. The exhibit was a failure in attendance. Only a few people showed up despite the elaborate invitations. Brooklyn might as well have been Mars. Once again I ignore common sense; I wanted to have a show regardless of financial loss or gain. 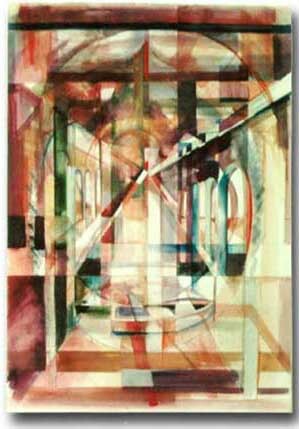 The show did encourage me to create a large body of structural watercolors including Boat (1983). These were also inspired by images of ancient sites of worship, caves, pyramids and open plains. They were stream of conscious in process while precise in content. On a personal level, a friend of the Hummels came, Bob Polk. We started dating.